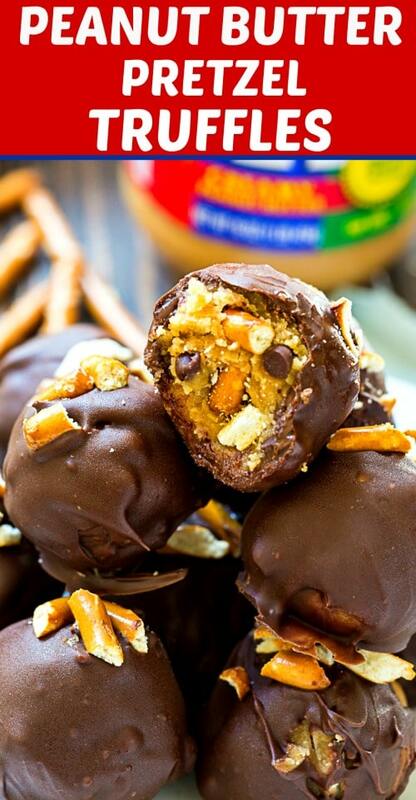 Peanut Butter Pretzel Truffles are so creamy and full of peanut butter, crushed pretzels, and mini chocolate chips. Such a great sweet and salty treat for the holidays. 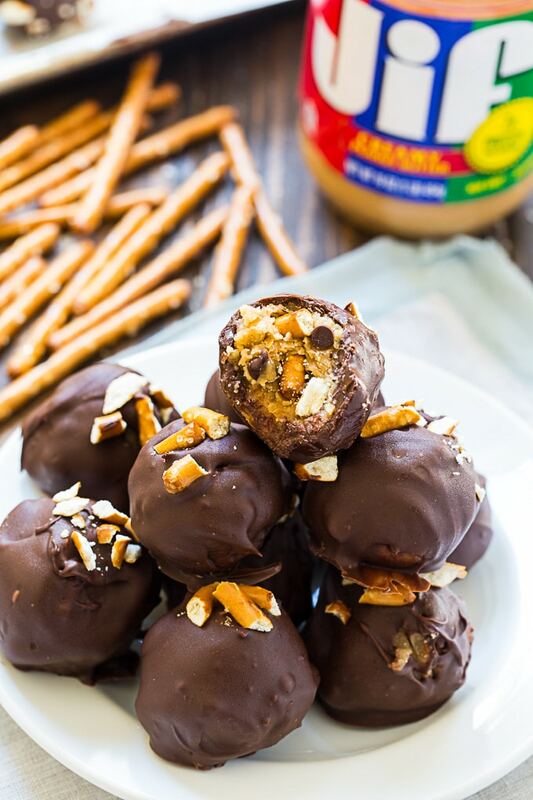 Peanut Butter Pretzel Truffles are coated in semi-sweet chocolate for lots of that magical peanut butter and chocolate flavor. Truffles make such a great candy for the holidays. Kids love to help make them and they are easy to make in advance and will keep for days in the refrigerator. 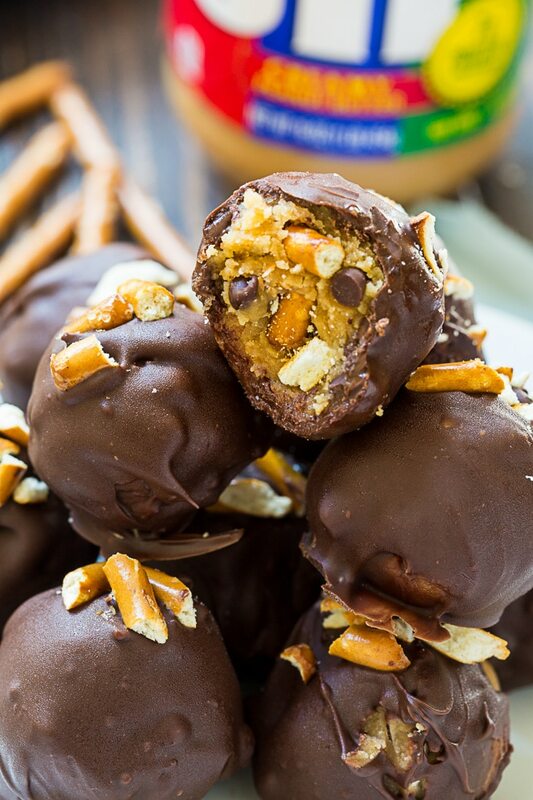 These Peanut Butter Pretzel Truffles have such a great flavor combination and the sweetness of the chocolate, the salty/sweetness of the peanut butter, and the salty crunch of the pretzels pair so well together. You have lots of flavor contrast plus the texture contrast with the crunchy pretzel pieces in a creamy center made from cream cheese and peanut butter. I like to coat these Peanut Butter Pretzel Truffles in semi-sweet chocolate, but you could use milk chocolate, dark chocolate or even white chocolate. Whichever is your favorite. 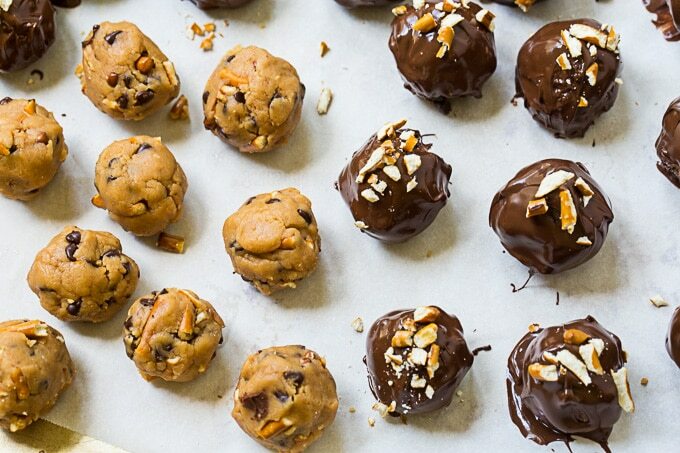 If you have an electric mixer it will make it a breeze to mix together the filling for these truffles. If not, you can mix them by hand. You will just get a little work out. The filling is a simple mixture of cream cheese, peanut butter, and powdered sugar. Mix them together well and then stir in the mini chocolate chips and crushed pretzels. Shape the mixture into 1-inch balls and refrigerate for at least 1 hour. Be sure to cover them in plastic wrap so that they do not dry out. Next dip them in melted chocolate chips with a little solid vegetable shortening or coconut oil added in. This will keep the chocolate from hardening too much. 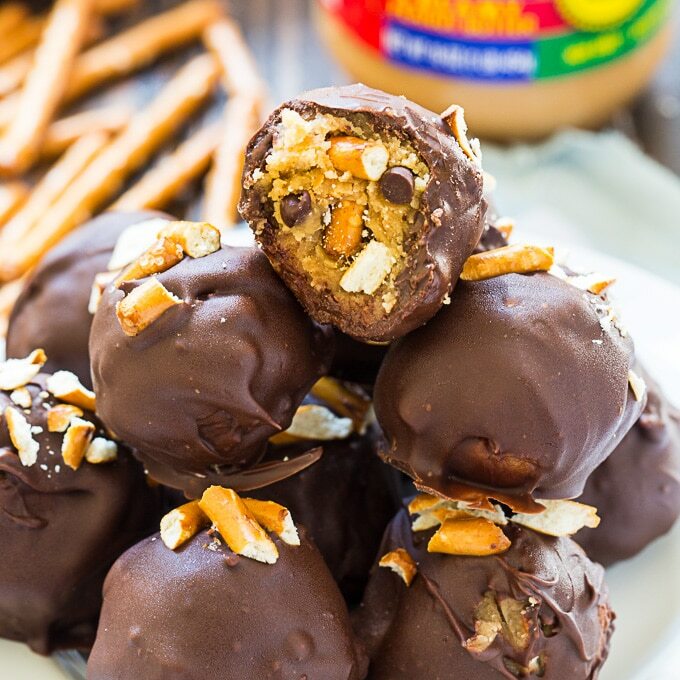 If you’re looking for no-bake sweets for the holidays, give these Peanut Butter Pretzel truffles a try. Add peanut butter and beat until blended. Stir in mini chocolate chips and pretzel pieces. Shape into 1-inch balls and place on a parchment paper-lined baking sheet. Refrigerate for at least 1 hour. Place semi-sweet chocolate chips and shortening or coconut oil in a small saucepan. Heat over low heat, stirring frequently until melted. Alternately you can place them in a microwave-safe bowl and microwave at 20 second intervals until melted. Using a fork, roll 1 ball at a time in chocolate. Scrape the bottom of the fork on the rim or the pan or bowl to remove excess chocolate. Place on parchment paper. If desired, sprinkle with crushed pretzels. Place back in refrigerator until set. This entry was posted in General and tagged Peanut butter, truffles. Bookmark the permalink. This is like all of my favorite stuff in one thing. I’m seriously going to try these. I would love to have one or two of these with a cup of coffee after eating lunch. I need something new to eat at lunchtime anyway. I’m a little leery of the cream cheese. But, I’ll give it a try. I know my wife would like this too. I love the combination of salty and sweet. I think the pretzels would counteract wonderfully with the chocolate. I’m also looking for new ways of sneaking peanut butter into my diet. Thank you for sharing this recipe. I doubt I’ll be able to make them look as beautiful as you did. Hope you enjoy them Michael!